Khan Dema is currently in the early stages of development. 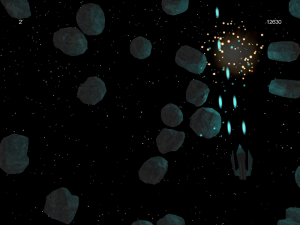 So far, there’s a working engine, and a spaceship that can shoot at asteroids. No interesting enemies or weapon types yet, though (I’m working on it). Khan Dema is released under the GNU GPL, and is available in Windows and Linux/Source versions. Public domain sound effects from www.johannespinter.com/inu/ljudbank.htm (which sadly no longer exists); music by BS used under CC-BY license. Khan Dema uses the Irrlicht rendering engine, TinyXML xml parser, and the cAudio wrapper for OpenAL, all of which are under LGPL.